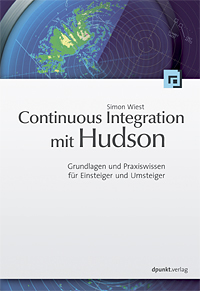 In June I had the pleasure to do a review of the first German book about CI with Hudson by Simon Wiest. The book is announced for December 2010 and it will cover topics from basic (setup, first jobs) up to deep knowledge like writing plugins for Hudson. Especially if you have a large number of jobs and they are running more often, you’ll come to a point, where your disk is full of old builds. Hudson provides a configuration parameter for that: „discard old builds“. 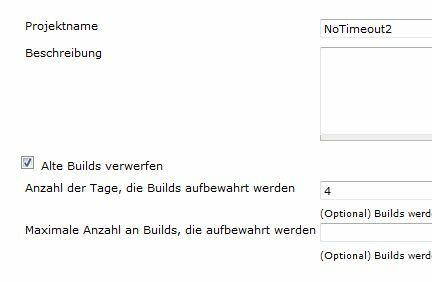 This will delete old builds according to the specified number of days or number of builds. For Apache I wrote a script which ensures, that all jobs have „discard“ setting and that existing values are not higher than a defined maximum value. header = "$col1 | $col2 | $col3 | $col4"
// Does the job have a discard setting? // What are the current settings? // Correct value or we arent allowed to override. // Correct value or we aren't allowed to override. println "$oldValue | $newValue | $jobname | $action"
printout = "Number of Jobs: $activeJobs.size"
In the first section I define the „constants“ (line 001-008). After that I define two closures which update a given Hudson job (line 010-018). The work here is in lines 053-088. But that’s pretty easy: check the given values and eventually set new values using the pre defined closures. New is the last line: I dont use a >x = „“< instruction for suppressing the output. I use a more meaningful message: the number of jobs. According to Entwickler.COM Microsoft has published a free ebook about „Cloud Computing“ by Bob Muglia. Golem.DE has found a free German video workshop about Gimp 2.6. On DZone Hudson creator Kohsuke Kawaguchi introduced his new startup, InfraDNA, which provides support and consulting for the Hudson Continuous Integration system. According to Entwickler.COM Microsoft has published a bunch of Powerpoint-Templates for demonstrating the new features of PPT 2010. 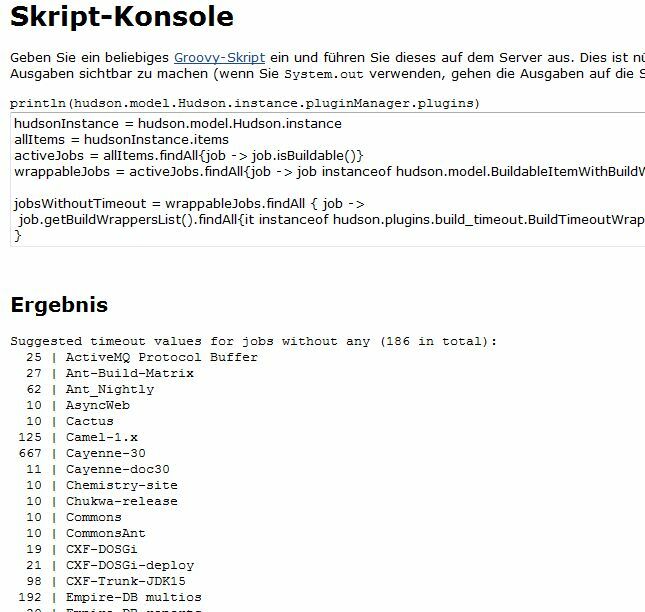 In my last post I explained why and how to check the timeout settings for Hudson jobs. On our mailinglist for Hudson users at Apache there was a suggestion to get an overview of (computed) suggested timeout settings. println "Suggested timeout values for jobs without any ($jobsWithoutTimeout.size in total):"
How to check if all Hudson jobs have a timeout? println "There are $jobsWithoutTimeout.size jobs without timeout:"
In line 1 we get the reference to the Hudson singleton. Then we get the list of all item in line 2 which we filter in line 3 to get only buildable items, like our jobs. The line 4 contains the first thing special to this requirement: the item must be able to have a BuildWrapper. But the most thing is done in line 5 which filters again with a closure: get all BuildWrappers for the job, but only if it is our TimeOut-Plugin. Because it can be registered only once, I check the first element of that list. It must be null for being a problem. Otherwise the job has a timeout setting. After that, the last two lines are simply out … and the last line supresses the result output in the console. We cannot make the timeout field mandatory. We can create a plugin that presets the timeout field. We can iterate over the projects and set a value for the timeouts en masse. Good, so I evaluate my „iteration solution“ a little more. BTW – If you want to work with a plugin, you could start with the Create Job Advances Plugin – maybe this requires code enhancement … and it will only for future jobs, not for existing one. println "Cur   |  Est  | Name"
currentTimeout = (wrapper != null) ? wrapper.timeoutMinutes : ""
action = (wrapper != null) ? "updated" : "established"
println "$currentTimeoutStr | $defaultTimeoutStr | $jobname | $action "
Today I found two tools for testing: Byteman and YouDebug.